Eriksen stunner keeps Spurs in the chase! Last year Dele Alli scored the goal of the season here at Selhurst Park, and tonight Christian Eriksen scored a simply stunning 30 yard shot that is surely a candidate for Spurs' goal of the season. It was certainly one of the most crucial, proving the difference on a night when Palace defended stoutly against a Tottenham side who were dominant, particularly in the second half. Spurs thus scored their 100th goal in all competitions this season;their eighth successive Premier League win (their best since the Double side of 1960-61), and most importantly closed the gap on Chelsea once again to four points with five games to go. We will all be cheering on Everton on Sunday before we face Arsenal in what will almost certainly be our last local derby in the current White Hart Lane stadium. 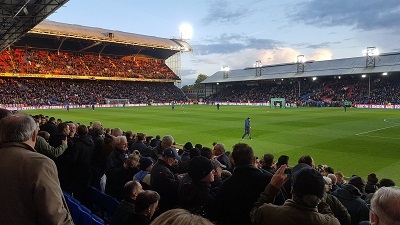 It looked like a full house at Selhurst Park tonight, and for once, the usually vocal home crowd was out-sung by the travelling supporters, whose repertoire included a ditty based upon the very latest social media alleged scandal involving a member of John Terry's family. The least said about that here, the better! Spurs once again dominated possession, but Palace had their moments in the early exchanges, with Townsend naturally keen to show his former manager his worth. Benteke, who had scored twice against his old team in Palace's win at Anfield on Sunday was largely kept under wraps by his international colleagues, Jan Vertonghen and Toby Alderweireld. Mauricio Pochettino showed some tactical flexibility, by switching quite early from his three at the back formation, soon pushing Eric Dier into a more advanced midfield role. Dele Alli could be seen playing deeper at times too, helping out in the defensive side of Spurs' game, but once again Dele was to the fore for Spurs all night. Spurs won an early corner which came to nought, before Palace enjoyed a little bit of pressure after Townsend won and took a free kick on the left, which Spurs ultimately cleared. McArthur held off Mousa Dembele and pushed a through ball to Benteke, but the striker was offside. Harry Kane met a cross from Eriksen on the right of goal, but fired wide. Townsend had a run from the left and was given room to fed the ball to Benteke, but his shot was easy for Hugo Lloris, who had almost completed his work for the night by this time. Eric Dier sent a good diagonal ball to Kyle Walker, but Hennessy came off better meeting the ball first. Toby Alderweireld tried a shot from distance, having been teed up by Dembele, but the effort was well over the target. Eriksen chased down a loose ball deep on the left and passed inside to Wanyama, who spread the play to Walker. Kyle fired a shot way over the target. Walker then received a long ball from Vertonghen, passing to Eriksen, whose deep cross was ultimately cleared by Palace without real threat from Spurs. Wanyama took the first booking of the game, over-stretching to try and retrieve a lost ball. Eriksen had a shot blocked after another Walker cross. After a corner taken by Ben Davies, Harry Kane's header was blocked. Wanyama was then perhaps lucky to get away with "words" from referee Jon Moss for another late tackle. After a foul by Dembele, and a Townsend free kick from the left, Townsend would himself have an attempt on goal in subsequent play, but he missed woefully. Palace then defended well when both Dele Alli and Harry Kane tried to take advantage of Kyle Walker's cross, after Alderweireld had started the attack. Pochettino made a double substitution at half time, replacing the risky Wanyama with Sissoko, and Dembele with Son. Son played on the left of an attacking midfield four, who played behind Kane. Dier was the one man in front of what was now a back four. Over the course of the half, I thought that Son and Alli forged a good understanding, without bearing the fruit we hoped for. In truth, Hennessy was also rarely tested, despite Spurs becoming progressively more dominant, and Palace becoming more and more withdrawn in their own half. Dele fed the advancing Davies, who crossed for Kane, but the Palace defence cleared from his feet. Mamadou Sakho, who is on loan from Liverpool, and did not play on Sunday, has become a great favourite at Selhurst Park, and he proved strong resistance to Kane, ultimately succumbing to injury. Sakho needed treatment and had to be stretchered off (to generous applause from both sets of fans) after he had over stretched and the referee waved play-on when Sakho had fouled Kane. The play ended in a weak shot by Dele Alli. Spurs piled on the pressure and after two quick crosses, Dele Alli pushed a golden opportunity wide of goal. Eriksen had a wall pass with Kane, before passing to Alli, whose decent right footed shot was held by the keeper. Son and Alli combined, feeding the ball to Walker on the right, but he too fired wide. After another Alli-Son combination, the South Korean just failed at the last hurdle to get in a shot. The Spurs pressure was becoming relentless, and surely a goal had to come. It didn't arrive after Kane won a corner, taken by Eriksen, and met by the head of Dier, but hit wide. The pressure did pay off though when Eriksen picked up a ball a good 30 yards out, and found himself space enough to hit a lovely low driven shot which beat the despairing dive of Hennessy. It was a stunning and crucial goal. The pressure continued by Spurs, who won three successive corners. From the third of these, Ben Davies headed down to Toby Alderweireld, who hit a snap shot just wide. There were seven minutes of added time, but Spurs ran a lot of this down with Sissoko and Eriksen taking short corners and frustrating the Palace players and crowd. Trippier came on very late for Dele Alli, but by now the game was up for Palace, and three precious points were in the bag for Spurs.